New Delhi : On a day the Delhi High Court dismissed Congress President Rahul Gandhi and his mother Sonia Gandhi's plea challenging the IT notice seeking tax reassessment for fiscal 2011-12, the party said the Narendra Modi government is "unnerved" by the Bharat Bandh and "is blinded by personal vendetta". 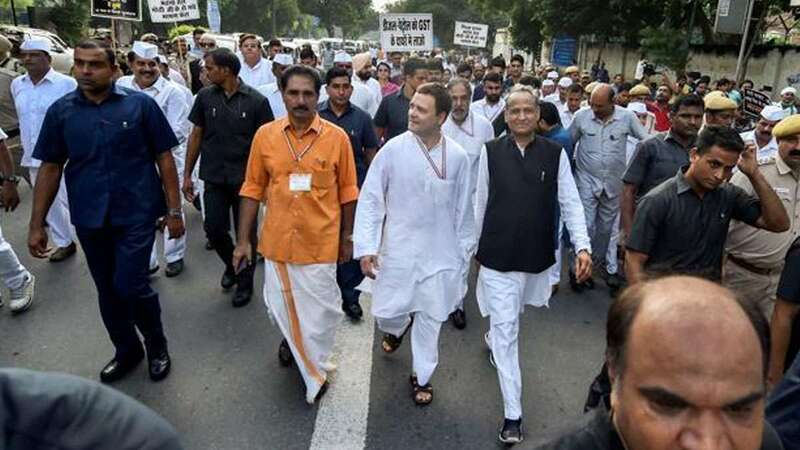 Congress spokesperson Randeep Singh Surjewala on Monday said: "Unnerved, perturbed and scared by the successful Bharat Bandh on fuel prices, Prime Minister Modi was forced to call a 'foolish press conference' and making stupid remarks which have no basis. "The Bharatiya Janata Party (BJP) spokesperson was asked by Modi to do a press conference and level allegations about which he has neither comprehension nor knowledge," he said. Surjewala said: "Facing imminent defeat in Assembly polls in four states and 2019 general elections, Modiji directed the Income Tax Department to reopen IT returns of the Congress leadership after a period of eight years." "The malafice and mala fide are apparent in the fact that all these IT returns have already been scrutnised in the past and we have no issues with that. A notice was also issued," he added. The party said it takes great pride in that fact that it gave Rs 90 crore as loan to National Herald and Navjivan. "This is first time in the history of India that corporate law has been rewritten by Modiji...that a non-repayable loan becomes profit in the hands of the shareholdrers of the company," said Surjewala. "Modiji is talking as if they knew about what the verdict was going to be. The argument of BJP that Bharat Bandh was called because of judgement of this case... Did Modiji know what judgement was going to be? "Did the judge tell them what the judgement was going to be? Bharat Bandh was announced a week earlier so did you know what the judgement was going to be?" the Congress leader asked. He said: "What kind of stupidity and foolishness is this? We humbly tell Modiji if you want to fight Rahulji, we dare you to fight a political battle with him. Don't hide behind a petty revenge through the IT Department."